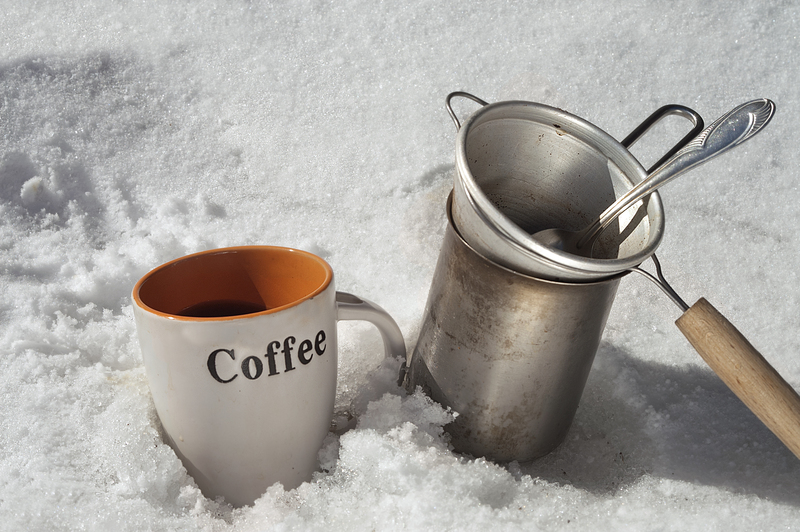 Imagine being able to experience the fresh chill of winter with a hot cup of coffee. When it comes down to satisfying a coffee craving no matter where you might be in the world, it’s imperative that you find a device that can travel with you wherever you’re headed next in life. Coffee can be one of the sole most important factors to ensuring that a morning gets started off on the right note. 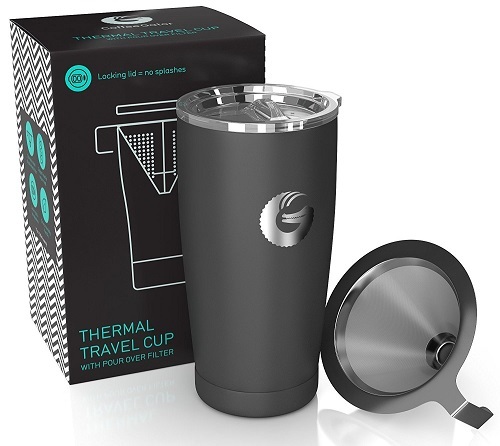 A travel mug is a good idea for short journeys to ensure you get a hot cup of coffee while on the go but isn’t ideal if you are going away for a few days or longer. That’s why you need a personal coffee maker that you can easily take with you. Finding the best travel coffee maker like a single cup coffee maker or a slightly larger portable coffee maker is key if you want to get your regular caffeine fix when you’re away from your home brewing machine. Therefore, we’ve made it our mission to seek out some of the top coffee brewer machines in travel coffee brewing devices so you can just choose one and get back to the happy trails that lie ahead. Getting your coffee fix while you’re out on the open road doesn’t have to be a hassle! If espresso makes you particularly happy, you won’t want to miss out on this beautiful small coffee maker that is the ultimate espresso shot brewer! An updated offering of previous models, this tiny little powerhouse can reach a maximum of 18 bars (261 PSI) of pressure to allow for the highest levels of coffee extraction quality possible. Each one of the espressos brewed with the Nanopresso is complete with a beautifully heavy layer of crema on top, so you can always achieve that gourmet coffeehouse taste that you crave when it’s time to rise and face the day. Coffee beans that have been finely ground and tamped down hard work best with this bullet-style espresso genie. 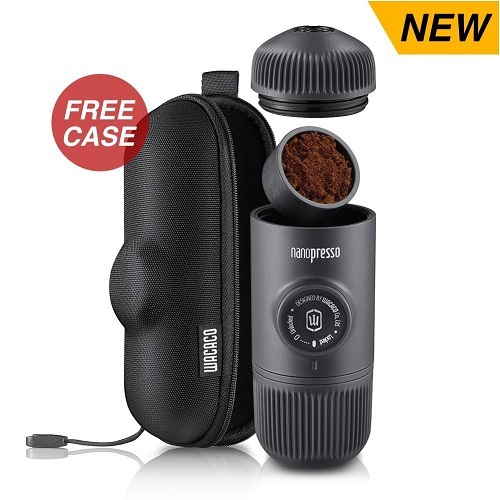 It even includes a carrying case and its very own cup to brew your shots into and the cup attaches directly to and protects the water tank when it’s not being used. This is definitely a more expensive choice for the most serious coffee drinkers, so it won’t be the most practical option that you can find. 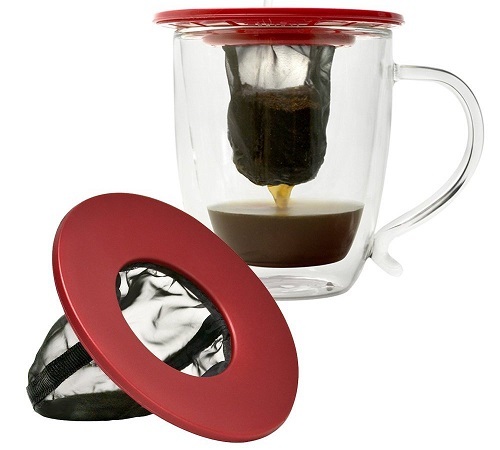 If all you need is a basic cup of coffee to feel your best, a very cheap coffee filter like this one from Primula is the only thing it will take to make a tasty cup of cold brew. When just one drink of coffee is all you need, you’ll simply drop your grounds down into the filter and pour your water—hot or cold—over the grounds before letting it steep for as long as you see fit. This filter should adjust to most mugs with its universal fit quite easily and it’s very easy to clean and reuse time and time again. Brewing your coffee with a filter like this can truly improve the taste of it and there’s something about doing it by hand that makes the flavors that much more potent. The price point is one of the most enticing things about this filter, but it also travels with you extremely well and that fact is key, so keep this in mind. As an offering that’s both high-tech in design and simple to use, the Coffee Gator Pour Over Coffee Maker is sure to impress! With a 4.5 star rating and a very moderate price point, there’s really nowhere to go wrong with the Coffee Gator brand. It couldn’t be easier to make a fresh, hot cup of pour-over coffee with the ingenious cone dripper that helps unlock all of the flavor potential of your coffee beans. All it takes is a couple of scoops of ground coffee loaded into the cone dripper and some hot water to brew up a delicious cup that you can enjoy whenever you’re ready. Vacuum-layered stainless steel and a copper-lined insulation wall come together to create the mug itself and your hot beverages will stay hot much longer than you thought possible. The Coffee Gator is easy to clean and safe to use in the dishwasher and there’s a 100% money-back guarantee if you’re unsatisfied with it once you’ve put it to use. The French press method of coffee brewing is classic and rewarding in taste—similar to what is achieved when the pour-over method is evoked. This particular travel coffee maker comes from the Ohuhu brand and it looks very much like a simple insulated beverage bottle, but there’s an entire French press system built right into it! The carefully-designed PP plunger extracts and holds all of the coffee grounds and sediment at the bottom of the mug so you can enjoy your coffee with less grit. The stainless steel filter is easy to clean and should last quite a long time so you can get endless uses out of this winner! The wine-colored mug itself is cool to the touch even when piping hot coffee has just been brewed and that thanks is due in large part to the double-walled insulation system. This particular travel mug is lightweight and easy to carry so you should have no problem keeping track of it. This newer item has limited reviews right now, but almost every one of the customers who has bought one of these mugs so far has been extremely satisfied with the purchase. The affordable price point makes this one hard to pass up! 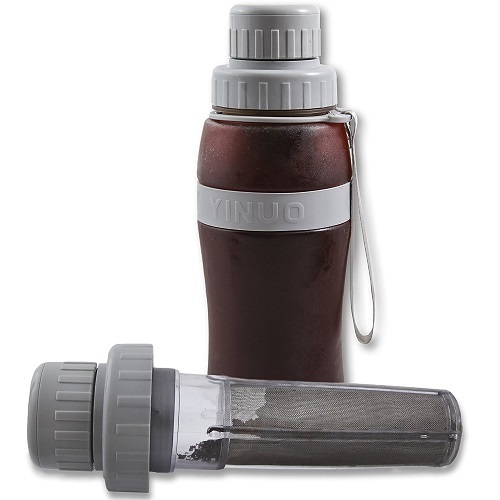 For the cold brew coffee lover on a budget, this coffee making bottle couldn’t be any easier to use. All you’ve got to do is fill the chamber with your favorite coffee grounds, fill up with water, give it a good shake and let it steep in your refrigerator overnight. 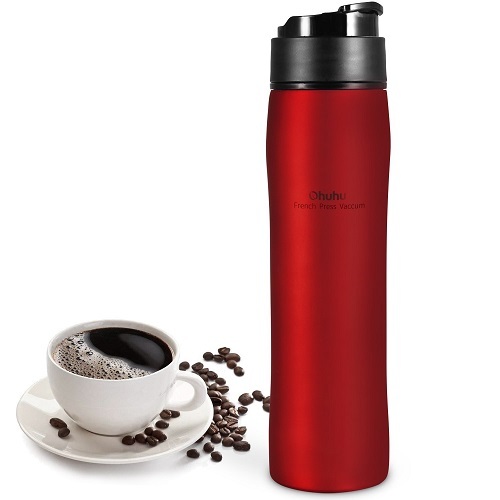 The bottle is constructed from a shatterproof BPA-free material and the airtight lid will keep your coffee fresh for weeks if left in the refrigerator untouched.